The Sure-Loc electronic deadbolt operates on four "AA" batteries and requires no hard wiring. The batteries in a keyless deadbolt like this will last quite a long time, but to be sure that you are not locked out, the lock will generate a warning light and sound to indicate that the batteries are low and need to be changed. Keyless deadbolts are easy to install and replace regular deadbolts installed on a standard door preparation. This is a single cylinder keyless deadbolt lock which means there is a thumbturn on the inside of the door and a keyed cylinder on the exterior. To lock you can activate the automatic lock feature, so the door locks as soon as you shut the door. You can lock from the inside using the thumbturn or you can lock and unlock with a key from the outside. - Entry codes can be from 4 to 6 digits. - Illuminated ten digit keypad. - Programmable up to ten entry codes. - Automatic bolt throwing direction for LH or RH door swings. - 25 Year Mechanical and one year electronic warranty. Fits Doors 1 3/8" - 2" thick. - Six in one adjustable latch. - Shipped with keyed 5 pin cylinder. 6 pin cylinder available upon request. - Master keying and construction keying available upon request. - UL listed for use on a 45 min fire door. - Works in a temperature range from -27 degrees F to 150 Degrees F.
Keyless deadbolt locks are one of those things that you don't realize how convenient they are until you have one. 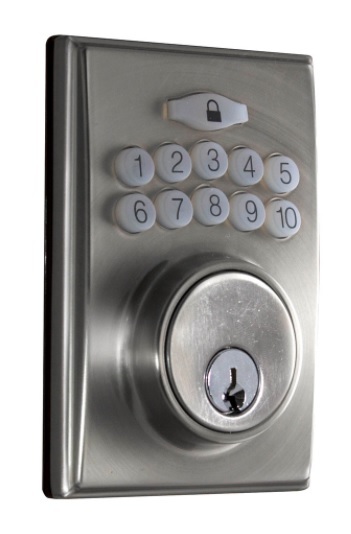 After having one of these on your door for just a few months you'll wonder why you didn't purchase a keyless deadbolt before.